Alice, the sheep, bellows at staff, trots down the hill and tries to flick her non-existent tail in excitement. Tiffany, the pig, snores in contentment. 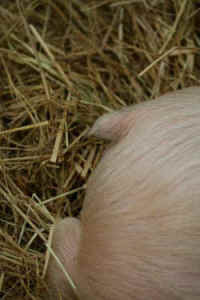 When Hazel approaches, Tiffany tries to swish her tail in irritation at the younger pig, but to no avail – hers was cut off as a piglet, leaving her with only a nub. Tails are as important to animals as hands and arms are to people. They convey messages, protect the body, and keep annoying pests (flies) at bay. Yet every year, millions of animals have their tails forcefully and painfully lopped off by farmers. Every year, 1.3 million cows on dairy farms endure tail docking, where up to 2/3 of their tail is removed. A cow’s tail helps protect her from biting insects and is necessary for communication. Unlike tail docking of other species, cows are almost a year old. Their vertebrae have fused and its forceful removal requires breaking the tail bone, then attaching an elastrator (rubber band) until the tail turns necrotic and falls off. The American Veterinary Medical Association (AVMA), Canadian Veterinary Medical Association (CVMA) and the American Association of Bovine Practitioners have taken positions of opposition to tail docking – so why does it still occur? Farmers claim it reduces mastitis, yet no scientific study supports that. 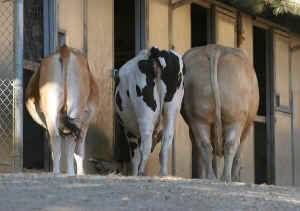 They claim it improves hygiene, yet cows with docked tails have larger fly counts. Dairy producers claim it reduces pus levels in milk, yet research shows this to be untrue. The real reason farmers dock tails has more to do with parlor design than hygiene or animal health – some milking parlors require milking from behind the cow. It’s easier to attach the electronic suction cups without a tail swat to the face. Human convenience is no reason to remove an integral part of an animal’s body. California – the nation’s largest exploiter of cows for milk production – banned tail docking. That has not stopped other states from allowing the painful practice. Through breeding, humans cursed domestic sheep with wool, a constantly growing fiber that must be sheared 1-2 times a year. Wild sheep have hair that sheds during spring. Extra wool around the tail creates areas for flies to lay eggs that may cause infection. Instead of promoting good health with routine health checks, producers cut off up to ¾ of a lamb’s tail without anesthesia. In the United States, 91% of farmers tail dock lambs and do so without pain relief. The common method is the elastrator, which leaves the lamb more prone to infection. Some producers use the electric docking iron, which cuts and cauterizes. Again, this is done without anesthesia or post-dock pain relief. Both are painful methods of tail removal. Tail docking is the by-product of breeding for profit instead of welfare. Tailed sheep can remain infection free if given a natural diet (grain increases diarrhea and soiling the rear) and observed during planned health checks. Removing body parts is hardly a fair solution to the sheep, who should not be used for their wool or flesh at all. Most of the 110 million pigs slaughtered and the 10-12 million “breeder” sows have their tails amputated without pain relief. Tails are used to communicate as well as protect the animals from flies. Pigs are curious animals and use their mouths for exploration. In confinement, frustrated piglets chew on anything near them, often their sibling’s tail. Tail biting is most prevalent on standard farms with thousands of piglets confined inside concrete-lined pens. Tail docking is a practice borne of greed and horrific housing conditions.